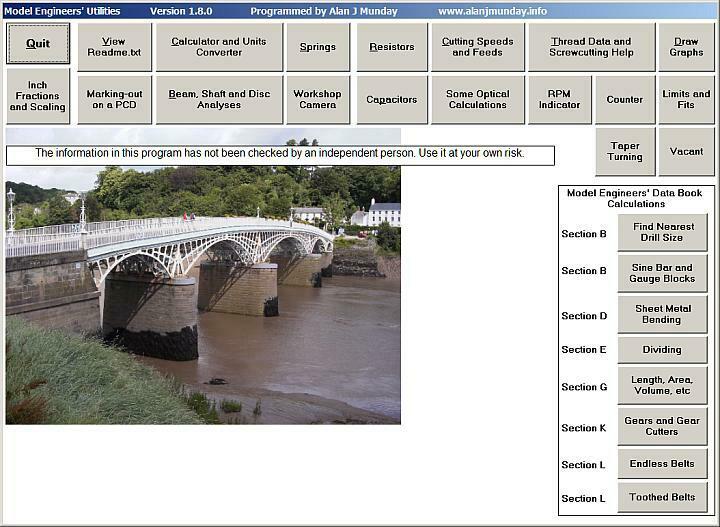 Model Engineers’ Utilities is a free, easy-to-use Windows program that has a very useful suite of calculators for machinists and engineers. There is too much to list here, but it includes one of the best cutting speed and feed calculator I’ve seen. It also includes thread cutting data, a spring designer, a unit converter, information for setting up tapers, a sine bar and gauge block calculator, sheet metal bending information and calculator, a gear cutting calculator, and much more. 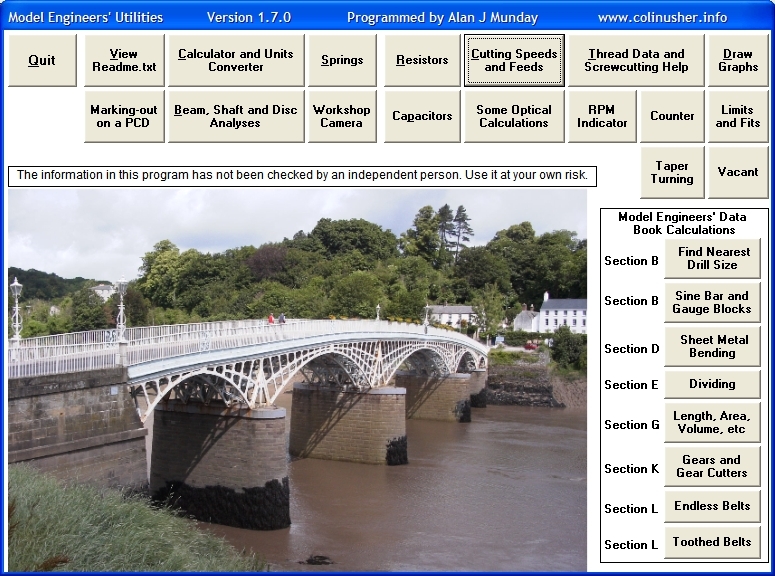 Both metric and English units are supported. There are other FREE programs on this site. Cant seem to run the ME utilities on my five year old Win XP computer. It runs on my old Pentium 2 though. There are no colours showing in the resistor and capacitor functions and other graphics issues in the other utilities. Please let us know if you figure it out, in case someone else has the same problem. Thanks for the advice Rob. I dont think the full Visual Basic is in WinXP home ed. I downloaded the vbrun60sp6.exe file but it didn’t help. Is there somewhere I can post a screen clip of the resistor calculator for others to think about? My old Pentium 2 runs Win98 and has no problem dispalying the correct picture. I have also tried various display resolutions etc thinking that might be the problem. Regards and thanks. Have you tried asking Alan, the program’s author, for advice? He may know the solution or be interested in helping you find a fix. You can post your picture in the forum if you want. Hi Alan. I have loaded your utilities onto my two computers. My pentium2 with WIN98 runs the program OK but my four year old ACER with WIN XP home ed. has a few graphics problem. Can you help? I am having problems with graphics too…I have just moved over to Windows 7 from XP… the Utilities software worked perfectly on XP but on Win 7 the background is black and I cant see half the text.